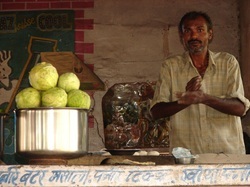 you cannot miss the street vendors who seem to be almost everywhere selling their Desi Street Food and Drink. Look beyond the establishment which needed a total refurb yesterday !! and try the food you will not regret it as they prepare some of the most tastiest and fresh food you can get in this region of the world. Below is a video showing the preparation of that classic Indian Snack The Dosa makes my mouth water just watching it.